NEW BRUNSWICK, NJ, – The Vue, the new luxury condominium building in downtown New Brunswick, has been something of an icon in this dynamic neighborhood since its grand opening, a 23-story testament to the appeal of urban living. Featuring a collection of just 42 Penthouse condominiums, an exciting suite of amenities and services, street-level retail and direct connectivity to the New Brunswick Train Station via a pedestrian walkway, The Vue’s formula for a vibrant and convenient lifestyle has clearly hit its mark, with 77% of the upscale residences now sold. Home buyers can still secure their place in one of the region’s hottest luxury condominium buildings as premium ownership opportunities for prime upper-floor, two-bedroom residences are available at prices starting from just $388,000. Immediate occupancy is available. 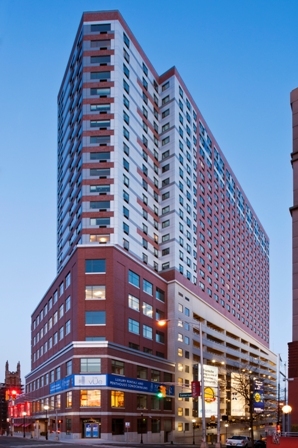 “The Vue has successfully introduced an upscale living experience in the heart of a dynamic downtown setting teeming with cultural, dining and recreational pursuits,” notes Christopher J. Paladino, President of the New Brunswick Development Corporation (DEVCO), which developed The Vue in partnership with Pennrose Properties and retained The Marketing Directors as the building’s exclusive sales and marketing agent. Residents of The Vue barely have to leave their homes to enjoy some of New Brunswick’s newest lifestyle attractions as the building features 57,000 square-feet of retail space in its first two stories, including a full-scale Barnes & Noble book store featuring a Starbucks cafe that is also serving as the Rutgers University Book Store, and a Brother Jimmy’s BBQ restaurant. There’s also a 657-space on-site parking garage. In addition, The Fresh Grocer, the first full-service supermarket in New Brunswick in more than a generation, and the 60,000 square-foot Robert Wood Johnson (RWJ) Fitness & Wellness Center, featuring a state-of-the-art workout facility, a Junior Olympic-size lap pool, a therapy pool and a therapeutic spa area, recently opened to the public a couple of blocks away. The Vue’s collection of two-bedroom Penthouse condominiums features upscale living spaces with lustrous wood flooring throughout the living and dining area, plush carpeting in the bedrooms, oversized windows, and the convenience of an in-home washer and dryer. Open gourmet kitchens offer rich custom cabinetry, smooth granite countertops, porcelain tile floors and a top tier GE Energy Star stainless steel appliance suite. Master baths are beautifully appointed with opulent marble flooring, custom vanities with silver grey granite countertops and oversized stall showers, while secondary baths are adorned with high-design choices such as sueded cappuccino hues, and an elegant soaking tub. “Residents also enjoy an exciting suite of amenities that enhances the overall lifestyle at The Vue,” notes Jacqueline Urgo, President of The Marketing Directors. “These include an attended, custom designed lobby; fully-equipped fitness center and residents-only lounge featuring a billiards table, flat screen televisions, WiFi business bar and a catering kitchen and conference room. In addition, The Vue has partnered with Verizon’s Virtual Concierge service to provide residents with additional services such as dining and building event reservations, and the ability to manage local vendors (i.e. dry cleaner, florist, housekeeping service, etc.) remotely. For additional information on The Vue and to schedule an appointment, please call 732-828-0111 or visit www.TheVueNJ.com. The building is located at 110 Somerset Street, New Brunswick, NJ. The onsite sales and leasing office is open Monday thru Friday from 10:00am to 6:00pm and Saturday and Sunday from 11:00am to 6:00pm. Furnished model residences are available for viewing.